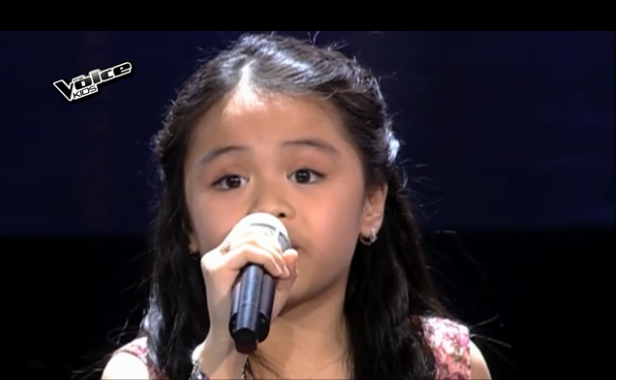 MANILA, Philippines - Eight year-old kid Telesa "Esang" de Torres from Tondo, Manila impressed the three coaches as they turned their red chairs in the Blind Auditions of ABS-CBN's top-rating and Twitter-trending singing competition "The Voice Kids" Philippines Season 2 on Saturday, June 20, 2015. The Mini Me of Lea Salonga and Promil i-Shine Grand Winner Esang sang Michael Buble "Home." In order to woo Esang, coach Sarah Geronimo shows off Lyca’s trophy but Coach Bamboo and Lea did something to get back at her. “Wag mong kalimutan! Sa akin galing si ate Lyca. At si kuya Darren! At si kuya Jason!" coach Sarah tells Esang. Esang chose to be part of Team Lea, joining Noah Anderson, Bianca Marbella, Reynan Dal-anay, and Stephanie Jordan. The continuation of the pilot episode of 'The Voice Kids' Season 2 dominates online conversations with '#TVK2Blinds' among the trending topics nationwide and worldwide.